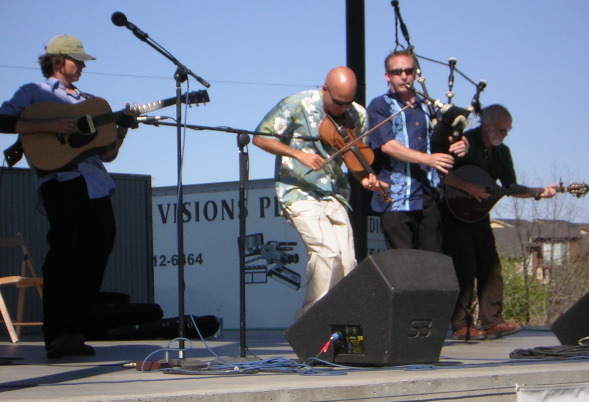 There is something decidedly different about Molly’s Revenge and their take on Celtic music. Having only heard their album The Western Shore, my observation may not be accurate in summarizing the group’s approach, but there is an unspeakable beauty in their performances that is not often heard within the genre. Many Celtic acts, especially those based in the U.S., are content to simply be as authentic to their roots as possible. Molly’s Revenge push it a step further, leaving listeners in awe with wind-swept, evocative landscapes. For example, as soon as you hear David Brewer’s title cut, you’re already transported to the vast, open fields of Scotland. Pete Howarth (bouzouki, vocals) and Stuart Mason (guitar, mandola, vocals) spoke to Twang Town about their band. 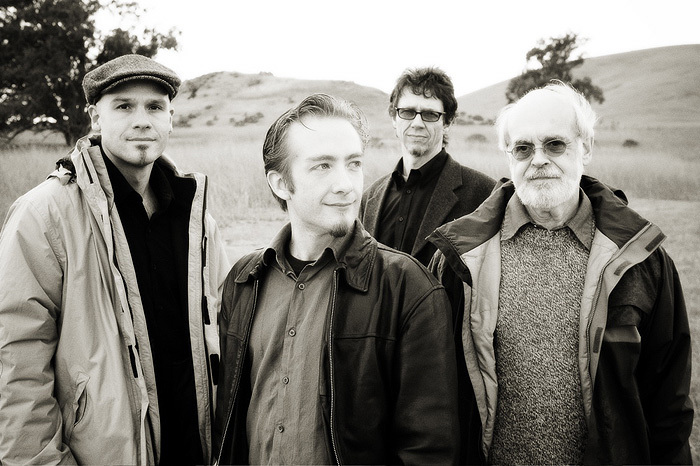 Carson James: Celtic music has always been on the fringes of American pop culture although it has a cult following that continues to grow every year, especially with the massive success of Flogging Molly, which combined a punk aesthetic with the genre. Why do you think the U.S. hasn’t fully embraced Celtic sounds? Pete Haworth: The first reason that pops into my head is that when most people think of traditional Celtic music, they think of old guys sitting around in a pub, reminiscing over the old days and playing scracthy fiddles. That type of Celtic music does exist and in fact it’s an important part of the tradition, but it doesn’t project a very cool image for the pop culture. But Celtic music has evolved from that stage into several other sub-genres. Flogging Molly, as you say is the latest example of a punk band playing Celtic melodies, although the Pogues were probably the first ones to make it big in that style. Then there’s the whole Riverdance and Celtic Woman phenomenons which turned Celtic music into theatrical extravaganzas and and made it wildly successful. So while what you might call pure Celtic music hasn’t made it mainstream yet, variations of it definitely have. We fit into a niche of Celtic music that is influenced by the style of music we each grew up with and we’ve all carried some of those influences over to the arrangements and thoughts behind the music we play. I grew up in the ’60s in England, listening to the Beatles and their contemporaries, and that influence affects the way I think about chord sequences, and arrangements. The other band members all bring their own influences to the table when we arrange our music. That’s actually one of the great things about the age differences between the band members: we each had a different generation of pop music that influenced our early musical thought, and we each build that into the band’s music. Hopefully, that combination of pure traditional and more modern influences will help get Celitc music more noticed. Stuart Mason: For one, the U.S. isn’t fully Celtic, if you look at the demographics. Folk music in general (of which Celtic music is a subset here) is sort of a fringe genre, when compared to pop and rock. But other folk musics are bigger here: bluegrass and delta blues, for example, because they are homegrown sounds. Celtic music is an import that has been given a big boost by the advent of the Internet, which allows for niche sounds to reach their peeps. One might argue that Celtic music is big here, but no longer recognizable: about 100-150 years ago, we morphed it into mountain music and from there into bluegrass and country. James: Is there a story behind the name Molly’s Revenge? Haworth: Well, originally no, at least not a very interesting one. The band formed at short notice for a St. Patrick’s Day gig and we had to come up with a name pretty quickly. I think it was me that came up with the name. The Molly part came about because one of the other members of the band was in another band with that name it, and I have no idea why I came up with the Revenge part of it! When Stu joined the band, he wrote a song in traditional folk tale style about the story behind the name, and we recorded. Stu’s a great artist and illustrated the story in comic-book style. There’s a link on our web site to the comic-book version of the song. We’ve been asked that question a lot over the years and now we have something interesting to say about it, thanks to Stu! James: Is Moira Smiley now a member of the group? How did you meet her? Haworth: Moira joins us for gigs whenever she’s able. She’s an amazing performer of many different styles of music and has many eclectic musical interests. Like all highly talented people, she’s much in demand so her time with us is limited. We wish we could get more of it! Moira has added a totally new dimension to the band with her great singing and has softened some of our rough edges, so to speak! She’s an excellent musician and has added a lot of ideas to our arrangements as well as gracing us with her beautiful singing. Our piper, David, first met Moira when she and David were involved with a touring Celtic Christmas show three or four years ago. Then we met up with her at a booking conferences that we attended, and she was at with her band VOCO. One thing led to another, and we ended performing together in our own series of Christmas shows in December 2007. After those shows were over, we decided we had such a great time working with her that we should ask her if she would like to work with us more often. I still remember the phone call I made to ask her about that – the response was a giggle followed by an immediate yes! We were all very happy she accepted! We were just about to start our second studio session for The Western Shore CD when that happened. It caused a mad scramble for us to work out a time when the band, Moira and our producer, John Doyle, could all be available because we really wanted to have her sing a couple of songs for the CD. I remember picking up John and Moira from separate flights and driving them back over to my house the day before we were due in the studio. We all sat around at my house that night throwing out song ideas, mostly proposed by Moira. We finally came up with a couple that we all liked and that John Doyle felt we could work with. The two songs were “Weave My Love A Garland” and “Youth Inclined To Ramble.” We’re very happy with the results! jammed some tunes with her on accordion. She’s a gentle spirit with the voice of an angel and the hair of a blazing sunset. James: When and how did Molly’s Revenge form? Haworth: A local pub, Henflings Tavern, was looking for a band to play on St. Patrick’s Day 2000 and invited a local band to play. Unfortunately, a couple of members of that band were out of town, but one of the other members, Mark, was a regular attendee at an Irish music session in Santa Cruz that the rest of the original band members attended. So he suggested that he, David, myself, and the original fourth band member, George, get together and play the gig. I think we had a week to get together a couple of hours of material. Fortunately, we all knew a lot of the same tunes and songs from the session so managed to pull it together in time. I still have a tape of that first gig and regularly threaten the original band members with blackmail! We didn’t really have any thoughts of turning that one gig into an ongoing project and didn’t do any more gigs for a couple of months, but then we all realised we’d had a lot of fun doing that gig and maybe we should try to get more, and Molly’s Revenge was born.Two of the original members left the band along the way but we’re still great friends with them and in fact we had a reunion concert in Santa Cruz last year with them and a couple of other ex band members – it was a lot of fun! Mason: I wasn’t in the band way back then, but it was in 2000, I think. I’ve been in the band for about five years. They needed a guitarist for tours in Hawaii and China… how could I refuse? The rest is history. James: Molly’s Revenge have released several records already. How has the band evolved throughout those CDs? Haworth: Yes, I believe we’ve recorded seven CDs in total although not all of them are still available. The very first one was pretty much a home recording project done on a four-track tape recorder at my house since we didn’t have any money for studio time. Contrast that with The Western Shore, the first time we have worked with a producer, and the difference is amazing. I think we’ve always tried to steer clear of the really well-known Irish and Scottish tunes and songs. You won’t hear us playing “Scotland The Brave” or “The Irish Washerwoman” on our CDs! I think each CD has had its own part in the band’s development, both in terms of musical skills and arrangements, and whatever preferences the band members at the time had. But the key for us has always been to find great melodies and songs that aren’t quite as well known and there are literally thousands of them in the tradition if you look hard enough. Some of the band members have also written great songs and tunes over the years and we have started incorporating more of those into our repertoire. They’re still written very much in the Celtic style but have that modern edge to them. For The Western Shore, working with John Doyle provided an amazing lift in quality. Some of us knew John on a casual basis before we went in the studio with him and knew he was an amazing musician but I don’t think any of us were prepared for the whirlwind that hit us that first day in the studio! We’d sent John mp3 versions of the tunes and arrangements over the previous several months and he had made suggestions back to us by email. But there’s only so much you can do like that. In the studio, John would get us to play whatever set of tunes we were about to record and then immediately come up with amazing improvements to them, some simple, some complicated, but all of them made huge differences to the way the sets turned out. We owe him a huge debt of gratitude for his influence. There was one arrangement I can vividly remember John coming up with. We were looking for an ending for the “3’s A Crowd” set, and John came up with this totally astounding sequence of chord changes to back a melody phrase that essentially repeated 14 or 15 times. The combination was out of this world and when we play it live now it’s just a magnificent, dramatic ending to our concerts. him on the team really raised the bar on The Western Shore.